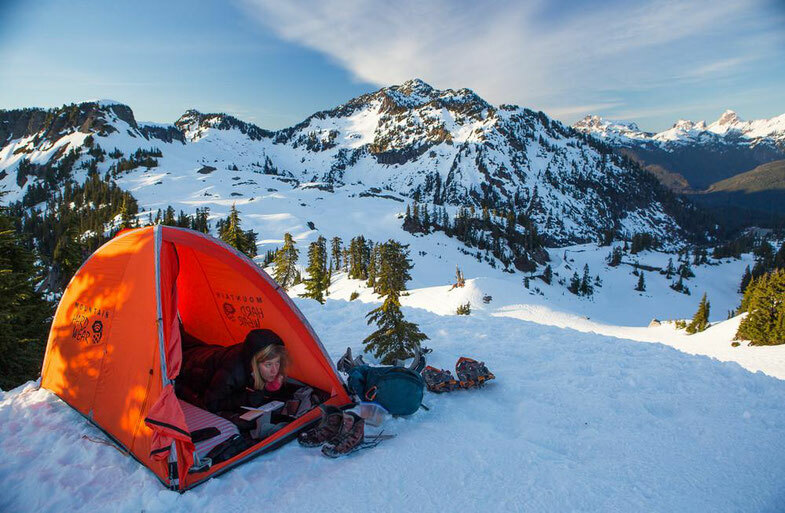 Nikki lays down her small tarp on a flat snowy patch in the middle of a desolate mountain range in the North Cascades and pulls her art supplies out of her backpack. She has a ziplock bag with a few pens, a water brush, a sketchbook, and watercolors. She is careful not to let the snow soak through her gear. The cold seeps around her body. She has about 20 minutes before the wind and brisk air become too much to keep painting. Nikki Frumkin’s art often begins this way. 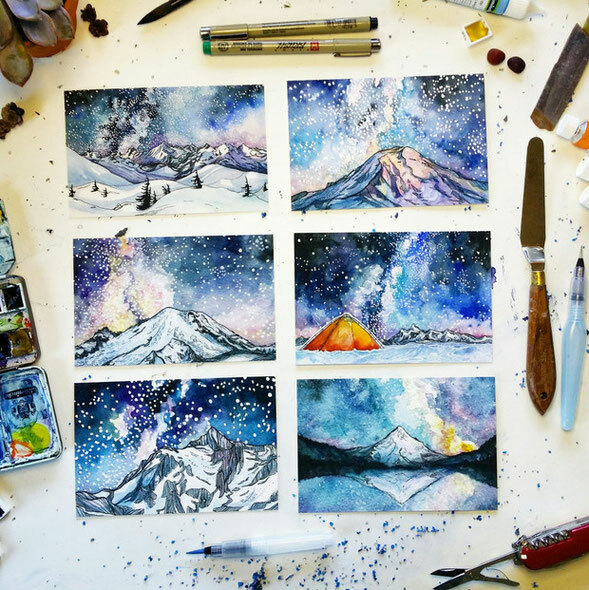 Surrounded by the jagged snow capped peaks of the Pacific Northwest, she finds inspiration in the presence of her favorite subject: majestic landscapes. 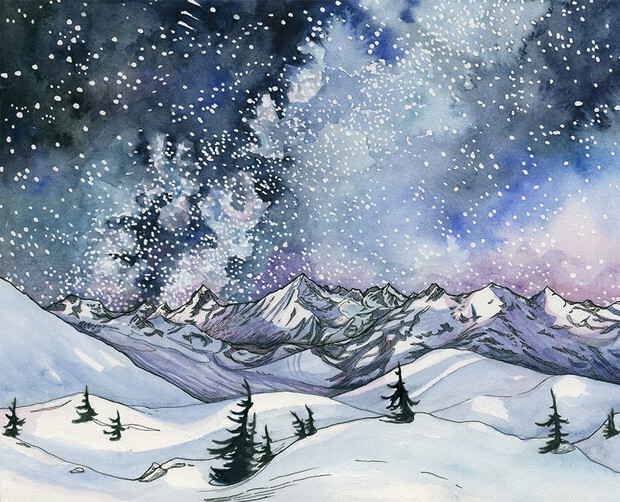 Nikki will often fill her brushes with vodka because they freeze at a lower temperature, allowing her to paint longer. This is one of the many hacks the painter has learned over the years. 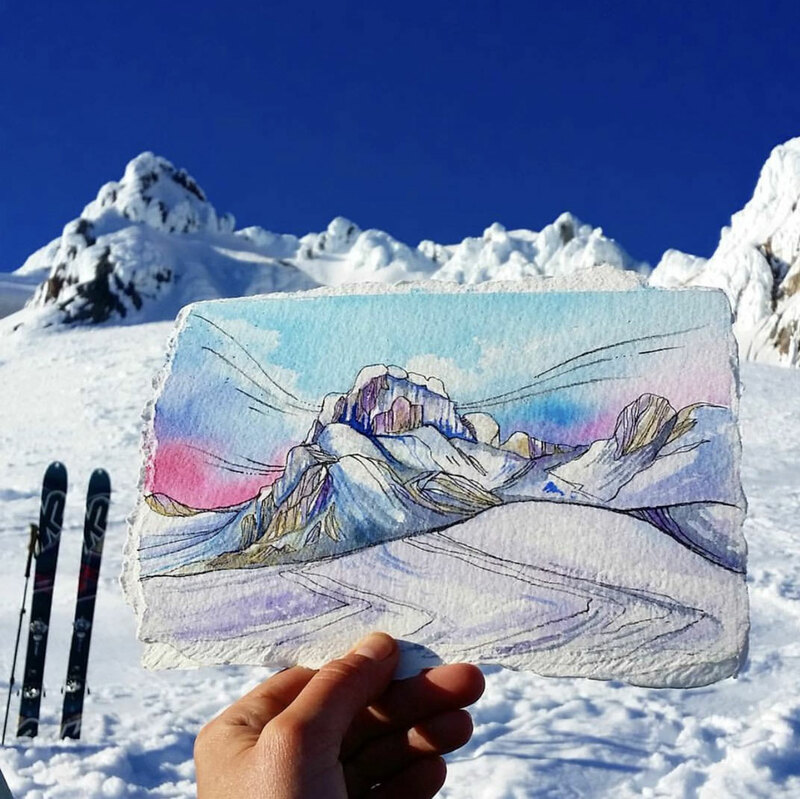 On her backpacking and single-day expeditions, Nikki rarely leaves her art supplies behind. 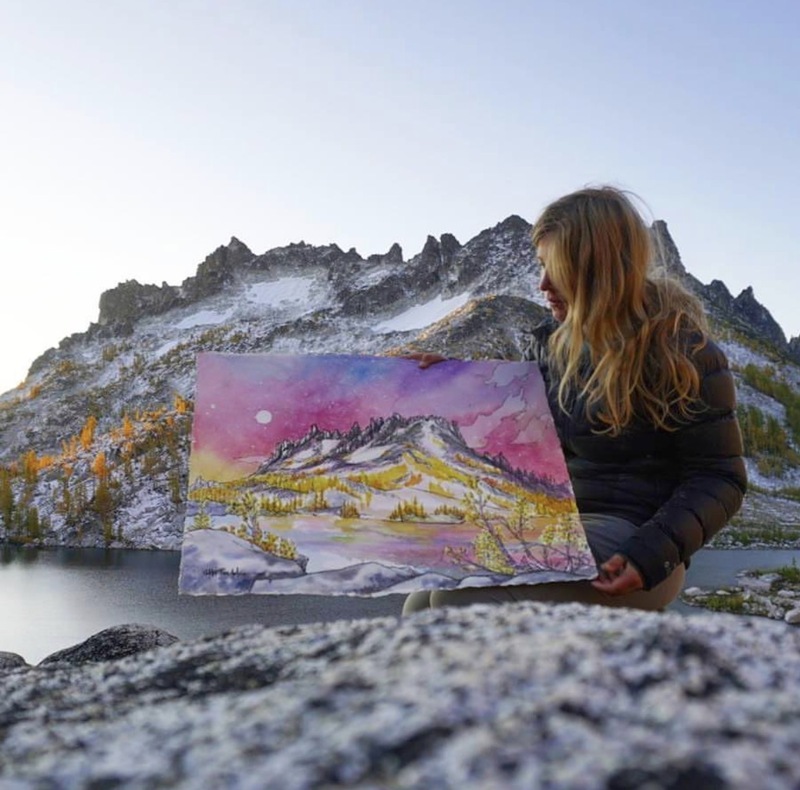 Rather than painting from a photograph, she prefers to paint when in the guts of the mountain range, often on a snowy ledge or mid-hike. “I am interested in capturing the feeling of a place, the wonder, movement, weather, energy, awe, suffering and joy of being outside . . . Those feelings inspire me to make art because I want to hold on to those moments. On the other hand, we also experience a lot of suffering in the mountains, our bodies hurt, we are hungry, tired, sweaty, dirty, lost. I want my work to represent that as well because it is those experiences that tie us together,” she writes. Nikki’s art evokes a reverence for the landscapes in which she finds herself. Additionally, there is a whimsical and playful nature to the colors and sense of movement she depicts. Nikki has made a business of her art and an art of her business. 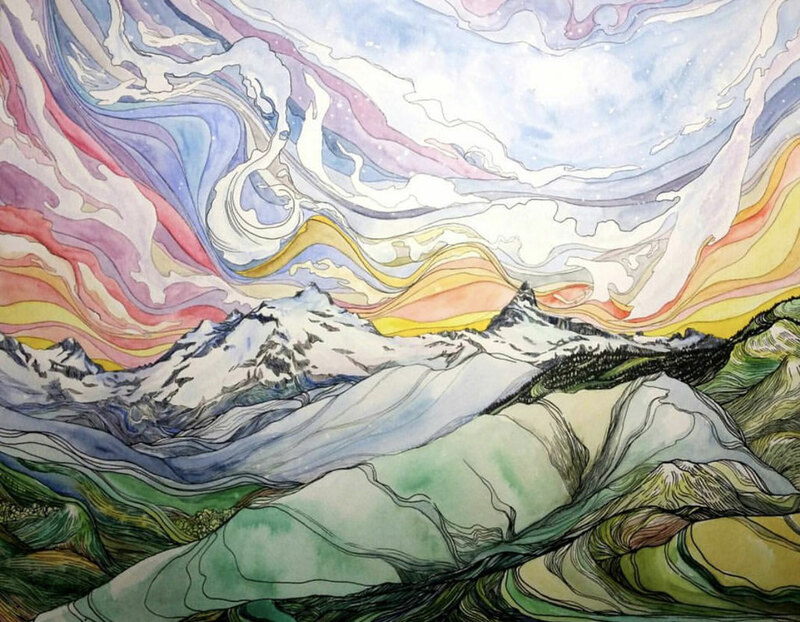 As an experienced mountaineer and painter, she combined these two loves. Upon return from her treks, you will find Nikki in her studio in Seattle, Washington, the headquarters of her business. It is in her studio that she perfects her pieces, crafting them into more detailed versions of their initial form. It is in her studio that she manages the sales, shipping and accounting for her art. 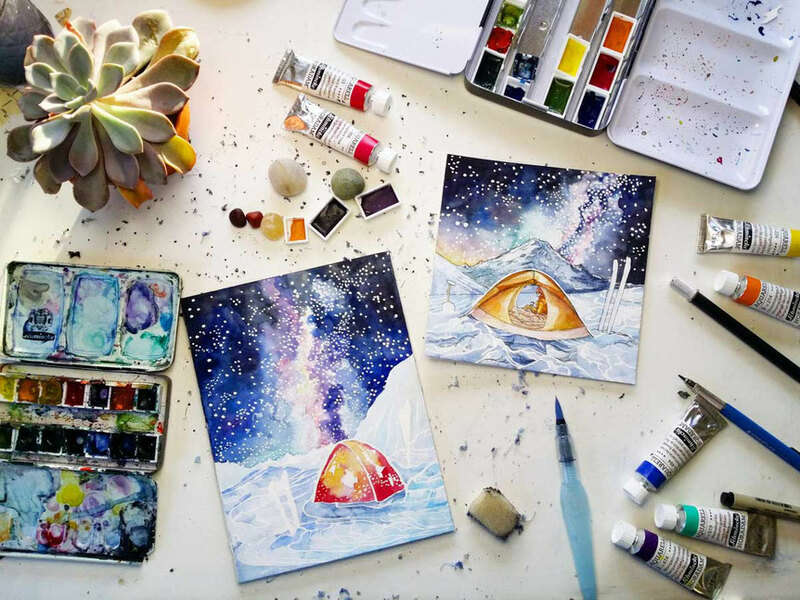 She also paints commissioned work, makes prints of her art for various stickers, posters, postcards, chalk bags, and backpacks, creating many iterations of her work. 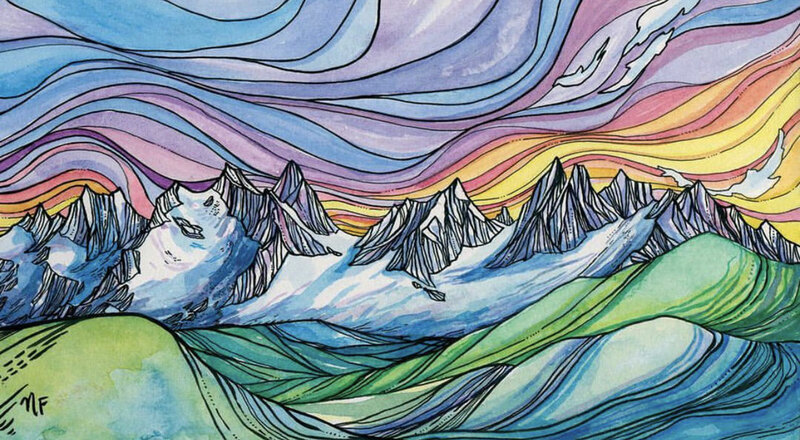 Over the last few years, Nikki has begun to share her expeditions and her art on Instagram (@drawntohighplaces). Her Instagram feed includes rare glimpses into remote landscapes, her happy grimace mid-climb on a rugged trail, and the sketches and paintings held before the very landscape she has painted, for reference. What may have started as social media sharing, has grown into an audience of over 36,000 followers. It’s not uncommon to witness 7,000 views of her latest video or a time-lapsed sketch from a recent trek. It is the love of the adventure that draws her to high elevations. Nikki mentions that she once spent her birthday hiking 28 miles in and out of the Enchanted Valley in the Olympic Peninsula, a wide open section of the Quinault River that sits at the bottom of waterfalled cliffs thousands of feet above the valley floor. 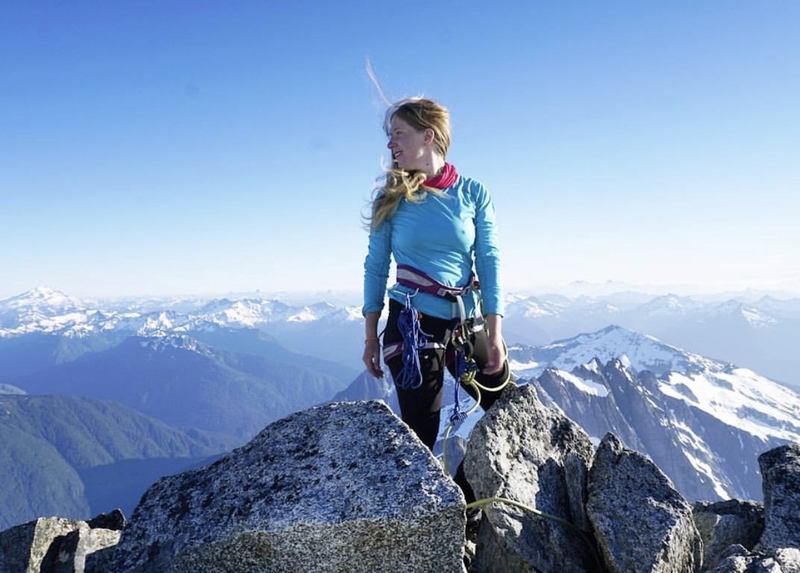 One of her favorite summits was Eldorado Peak, also in the North Cascades Mountain Range of Washington State. Eldorado is an 8,868 foot knife edge ridge peak, perched at the edge of the largest contiguous ice-sheet in the lower 48 United States not connected to a volcano. This climb boasts 6,800 vertical feet, not including ups and downs of the trek. But Nikki’s favorite mountain is Rainier, the highest mountain of the Cascades Range, winking at her from 54 miles south of her Seattle home. Though it takes no shortage of grit to climb mountains and make new art, building a business from scratch presented itself as a new and foreign challenge to Nikki. Despite its challenges, she has grown into it and her business has grown to fit her lifestyle. In between adventures, Nikki took the time to speak to us in profound ways about the art of joy and suffering, the mountains that have inspired her and how she build a business about and around her lifestyle. "I am not afraid of making mistakes in my painting. fresh. I should take some of those lessons into climbing." What's one thing about you that most people don't know? I grew up speaking a lot of languages and that has given me a deep love for languages and how we express ourselves. My mom, who is Swiss, raised me and my twin sister in Swiss German. My dad spoke to us in French growing up. He learned the language from his father who was a translator during world war II and said that speaking French saved his life. I later learned Portuguese from my Dad's wife when he remarried and a bit of Spanish from my close friends in High School. I am interested in how language shapes and influences our world view. I think art also has the power to shape how we think. What is your favorite trek or summit so far? Oh! All of Washington is so awe-inspiring so that is a tough question! I have a soft spot for Mount Rainier National Park. Mount Rainier is visible from many places I spend time in in Seattle, so seeing it makes me happy. And being in the park is so inspiring. My favorite summit might be Eldorado in the North Cascades. I faced huge fears of exposure to get to the final rock pile. I had to walk across an airy narrow knife ridge, with thousands of feet on both sides. But I did it, I even led it, and that felt really good. 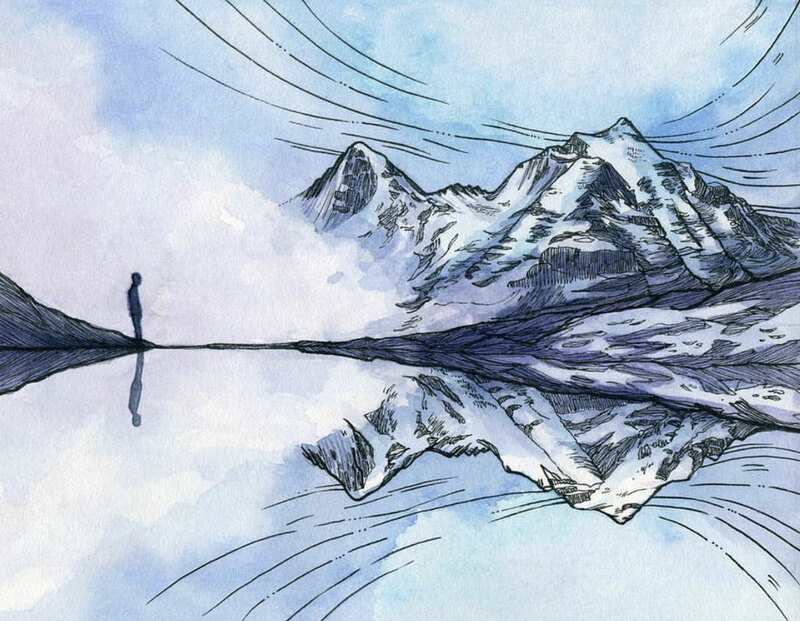 How did your mountaineering career begin? It began because I wanted to go higher! I have a thing for seeing what's on the other side of mountains, ridges, peaks. I really wanted to see the view from the top of our Washington volcanoes so I began to learn the skills that would allow me to do that. It was a tough journey-lots of crying in the beginning. Being in the snow in the cold and dark was so hard. Now I still climb for the views, but I have come to love the journey and movement of the climb as well. What are you trying to capture in your paintings? I read a quote of yours that said "My work thrives on that conflict between wild awe and suffering." What does this mean to you? I am interested in capturing the feeling of a place, the wonder, movement, weather, energy, awe, suffering and joy of being outside. When I am outside I feel like anything is possible and I can do anything I set my mind to. Those feelings inspire me to make art because I want to hold on to those moments. On the other hand, we also experience a lot of suffering in the mountains, our bodies hurt, we are hungry, tired, sweaty, dirty, lost. I want my work to represent that as well because it is those experiences that tie us together. Sometimes that means celebrating the contrast between those feelings and other times the joy or suffering wins out in the painting. Can you name a quality about yourself that helps make you good at what you do? Hmm, good question. I am not afraid of making mistakes in my painting. In my climbing life- absolutely, yes, always scared of messing up, but in my painting I give myself freedom to take risks, try new things, and mess up. I think that gives my paintings a lot of space to grow into something fresh. I should take some of those lessons into climbing. 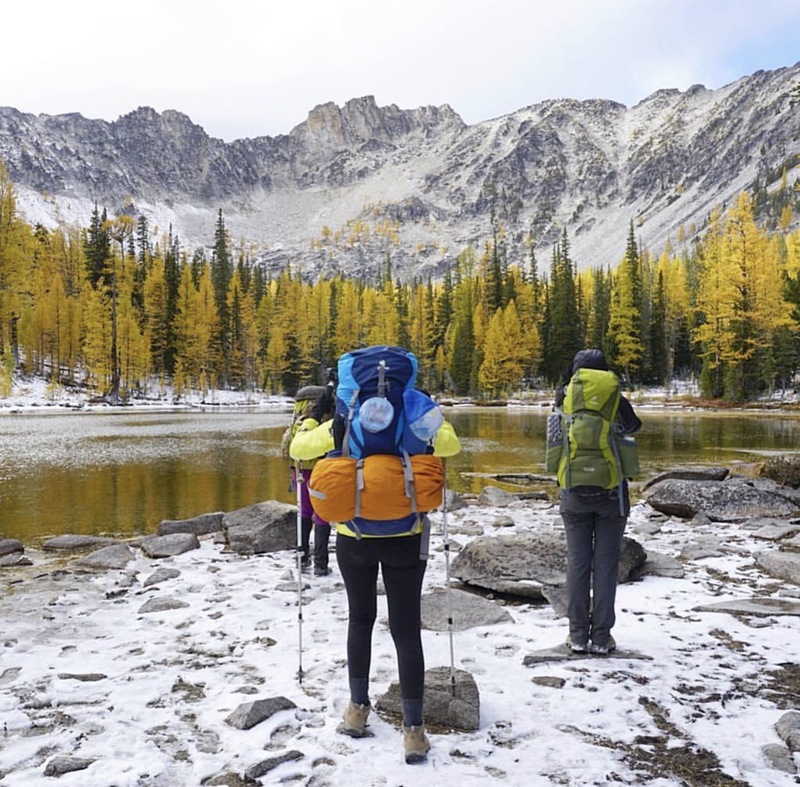 What are your biggest fears when trekking alone and how do you calm your mind of them? Camping alone is what scares me most! I don't do it that often because the noises outside my tent conjure all sorts of scary senarios. But, the more I do it the more comfortable I get. I try to focus on the small joys of the moment instead of worrying about what if. Why are you drawn to high places? I am drawn to high places because the air feels like a million possibilities and the views are mind boggling. Being in high places makes me feel humbled, powerful, and joyful. What about your life, art or business are you most proud of? I am really happy that I get to do what I love. I'm not sure if proud is the right word, but I am so happy for the journey. Have you ever had a trek gone wrong or close calls (getting lost, big storm, wildlife, etc.). What happened? We all begin somewhere, even the most badass adventurers. I made a lot of mistakes in the beginning. Including going for an ocean swim wearing all my cotton clothes on a four day backpacking trip. I thought they would dry over night, but turns out I was just wet and cold the whole time! I've learned a lot since then, but it's important to remember we all start the journey somewhere and are always learning. What media do you consume that is important to you or your lifestyle? I am constantly listening to podcasts in the car or while I paint at home. A few favorites are Planet Money, Hidden Brain, On Being, Ted Talks, The Moth, Dirtbag Diaries, the She Explores podcasts. What have been the hidden/unexpected challenges in creating a business around your art? The idea that being an artist meant creating a business was a surprise to me. Figuring out the business side of things was tough. I am still constantly learning how to make it easier. What mistakes have you made in mountaineering or your business, practical or abstract? Oh my. I make all sorts of mistakes. I forget stuff at home all the time when I'm on big trips. Things like gloves, sporks, socks. Usually it's just annoying. In business I have a really hard time keeping up with emails. I get excited about big ideas and sometimes feel like the project is done once I can see it in my head. Even if it still needs more action in real life. I think it's because that's how I approach painting. I like to take my paintings to the edge of understanding the vision without actually finishing it. That way it leaves some excitement and work for the viewer. What was a surprising business hack you have learned? People are really kind and forgiving. If you find yourself worried about a situation, just talk to them and tell them your story. What piece of advice do you wish you had been given and followed at the age of 25? Be exactly who you are and don't worry about trying to fit in or change who you are. Name one thing you have had to give up on to make your lifestyle possible? Has it been worth it? For years I had to give up free time. I was working a teaching job during the day, then coming home to work on my art late into the night. Weekends I would run to the mountains. I was exhausted and missed all of my friends who didn't climb mountains. You have almost 31k Instagram followers. How have you built your audience? I love Instagram because it allows me to tell my story of art and adventure and it connects me to people who share those loves. 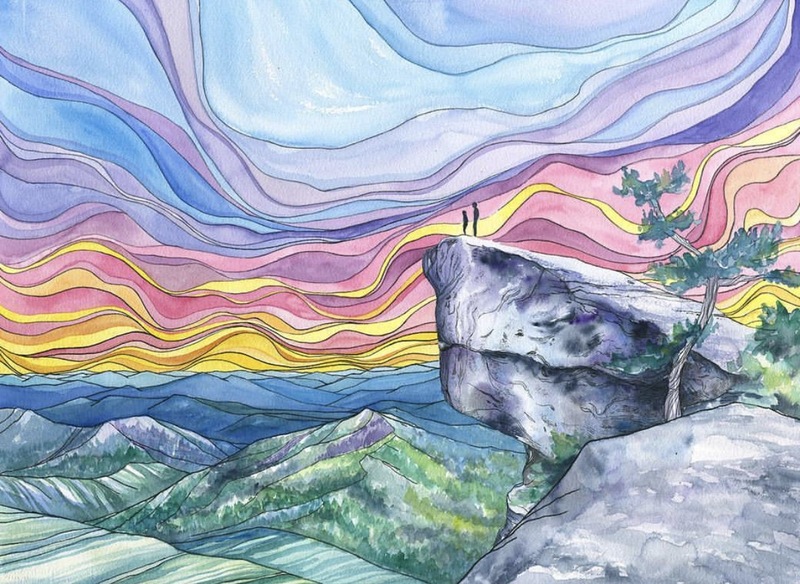 I have made so many good friends on instagram: artists, climbers, mamas, art lovers, business connections and more. The trick with Instagram is to be yourself, don't try to hide who you are to fit in. If you tell your story, people will see and respond to that. 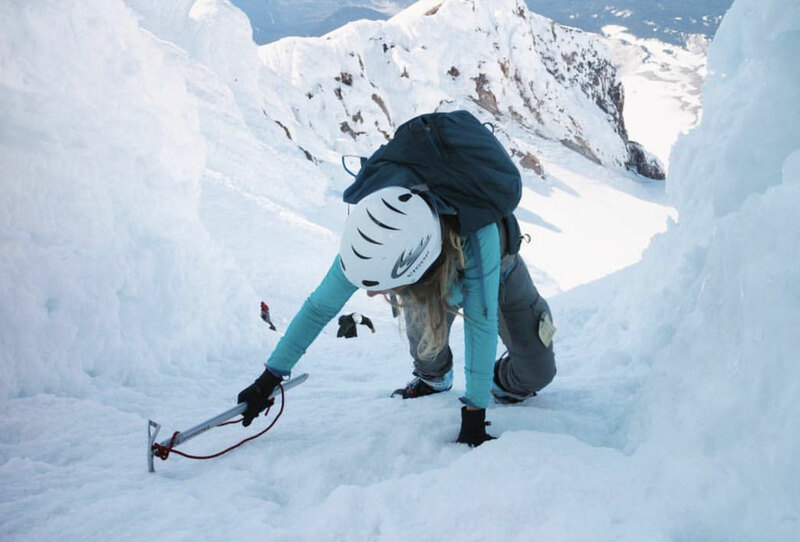 Running a business and mountaineering both include a lot of challenges. How/Why do you think people persevere despite adversity? So many challenges! The only way I can do this is because it brings me so much joy, even when it is exhausting or hard. We persevere because it is the only way I think. If you had to provide a private motto for your lifestyle, what would it be? Be yourself, all mistakes included. And allow yourself to make tons of em.